Halloween is upon us and I can’t wait. I haven’t decided on a costume, but my crafting brain has been in overdrive. 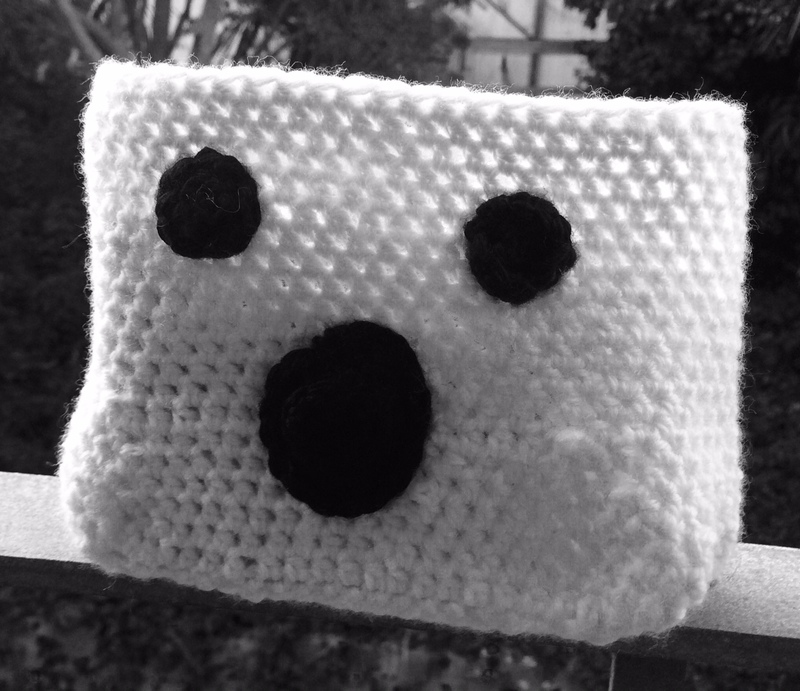 My first project… a Crochet Ghost Bag! This would be a perfect candy dish to have in the office or on the coffee table. If you desire add a handle and make it a children’s trick or treat bag. Pattern begins with constructing the bottom of the bag (rectangle) and then transitioning into creating the bag in the round. Materials: about 50 g Worsted weight yarn in white, small amount of black yarn, US size 10 or J crochet hook, yarn needle, stitch marker if desired. Beginning to shape the round bag section.Slight increases will be made in the corners of the bag. For the rest of the rows: 1 hdc in all sts until piece measured 5” in height or you until the piece has reached your desired height. Using scrap yarn create two eyes and a mouth for the ghost. Round 1: Ch 5 sts. Follow pattern for eyes until R4. Sew on the eyes and mouth with your tapestry needle.